How to Remove Your Profile Name and Picture in Facebook Sponsored Stories-Social Ads. Mostly many people might have seen that Facebook is using our profile names/profile pictures in Sponsored stories like Social Ads or Third-party Ads. So If you want to know about how to opt out yourself or how to stop facebook from using your profile name/photo in facebook social ads then have a look at the below part. It means your profile name and photo will be used in advertisements targeted at your friends, and vice versa but not on a national campaign. These sponsored stories can appear in your News Feed or on the right side of your homepage. Maybe it’s not a problem for some people to have their profile names in facebook social ads but for some it does as they are more bothered about privacy. 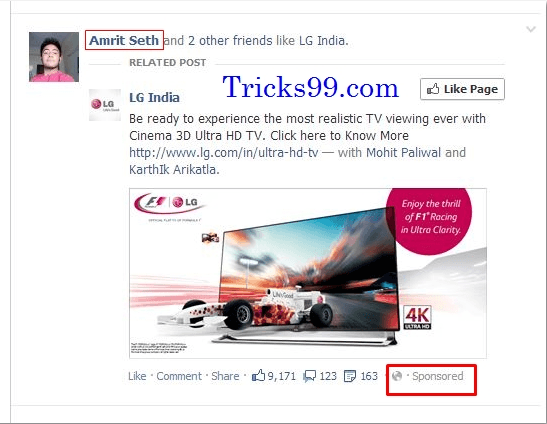 In general, the sponsored stories on Facebook are of two categories called social ads and third party ads. Social Ads means when you like any pages, events or apps your profile name/picture will be used in ads. Third-Party Ads means when you like any third-party apps or websites etc your profile name will be used on those sites by facebook plugins. 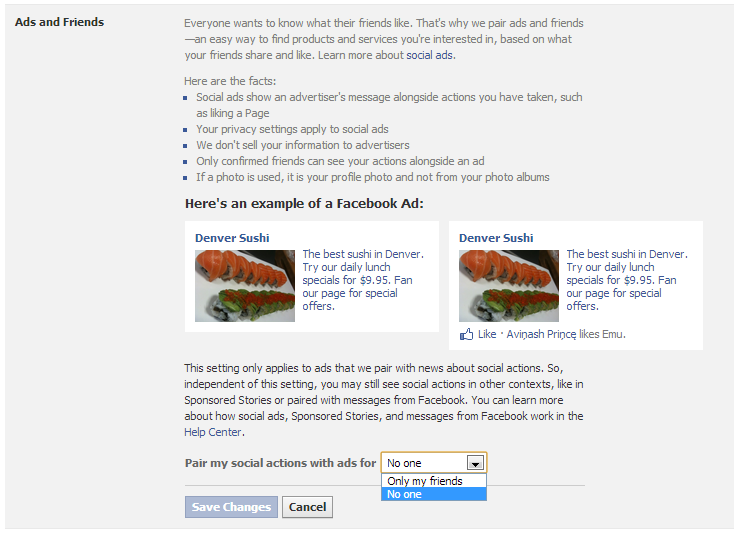 To remove your profile name/picture in facebook social ads, Click Here. The default setting for allowing ads will be ‘Only my friends‘, So now change it from ‘Only my friends’ to ‘No one’ and click ‘Save Changes’. Now you won’t be shown in any social ads of Pages, Events, and Apps. 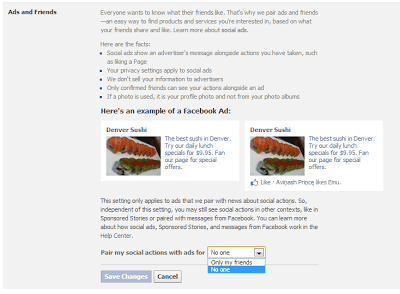 To remove your profile name/picture in facebook third-party ads, Click Here. The default setting for allowing ads will be ‘Only my friends‘, So now change it from ‘Only my friends’ to ‘No one‘ and click ‘Save Changes’. Now you won’t be shown in any social ads of third-party apps and websites. That’s it. Now you have successfully removed your profile name/photo in facebook sponsored stories-social ads. One thing you should always remember is Facebook will never sell your information to any advertisers. It actively enforces policies that will help to protect your experience with third-party apps and ad networks. For more information about Ads, you can check the official Help Center of Facebook by Clicking here. I hope this post will be useful to you all, please help us to grow by sharing our site with your friends. How to Memorialize or Remove a Dead person’s Profile on Facebook. How to Hide pages Which you LIKE on Facebook. Please my account has been disabled, I can’t find my self on FB anymore even using someone’s account. I was told to upload an I.d but I uploaded a picture of mine the I keep on seeing this when I try to login. We’ll get in touch with you at the email address you provided after we’ve reviewed your ID. You will now be logged out of Facebook. ever since then I can’t login. please help me, I want to activate my account back and I don’t want to loose my pictures I uploaded there. Your site is very well done. And your posts are most helpful. I am continually enthralled by the creativity of the human being. I will refer back to your site again. Great success to you, my friend.